﻿ GEICO vs Progressive: Which Car Insurance Company is Better? GEICO and Progressive are two of the biggest insurance companies in the car insurance world. Ranking as the second- and fourth-largest car insurers, respectively, they both claim to offer solid customer service, low rates, and abundant discounts. If you’re considering switching to GEICO or Progressive, here are some facts to help you make an informed choice. Want to start comparing the big insurers against the smaller insurance companies? Start comparing car insurance rates now. Just Looking to Compare Quotes? Get Multiple Rates in Just Minutes! GEICO was founded in 1936 as the Government Employees’ Insurance Company. Today, the company serves all kinds of drivers and insures more than 20 million vehicles. In 2013, it overtook Allstate to become the second-largest car insurance company in the United States. GEICO is owned by multibillion-dollar conglomerate Berkshire Hathaway, so its financial strength is unquestioned. Low prices have always been GEICO’s number-one attraction. The company says its new customers report an average annual savings of $500 or more each year on their car insurance. Low prices don’t mean bad service, GEICO hastens to say. The company prides itself on its prompt customer care. The secret to the company’s success, auto insurance analysts say, is spending vast amounts on advertising — $1.1 billion in 2012 — and nothing on agent commissions. GEICO is a direct writer, meaning the company issues free insurance quotes and policies from its central office. GEICO did, however, score poorly for its overall purchase experience in the 2013 Insurance Shopping Study conducted by J.D. Power. To view the new 2017 J.D. Power Shopping Study results, click here. Progressive was founded in 1937, just a year after GEICO, and has long been known as an innovator in auto insurance. Progressive was the first insurance company to offer lower rates for low-risk drivers and the first to let customers compare free insurance quotes on its website. From 2008 to 2010, Progressive sponsored the Automotive X Prize, a competition to develop the first vehicle to get 100 mpg or its equivalent. Progressive touts its customer-friendly web features, such as Name Your Price — a tool that allows users to enter their desired car insurance expenses and then suggests policies that fit their budget. However, like GEICO, Progressive scored below average for its overall purchase experience in the 2013 Insurance Shopping Study conducted by J.D. Power. Progressive uses a system of independent agents, which many customers like because they offer personal attention. However, the agent system also “absorbs dollars that could produce greater return in ad spend and lower prices,” reports the InsuranceJournal.com. Unlike GEICO, Progressive does not list the percent savings for the discounts it offers. You can see how much you’ll save when you get a quote. Snapshot safe driving discount: Discounts for safe driving habits, tracked by a small device that’s installed in your car for 30 days. Customers report saving up to 30 percent. Online discount: You get an immediate car insurance discount of up to 7 percent simply by buying your policy online and a $50 deduction by signing the documents online. When looking for the right auto insurance policy, great customer service is usually on the top of everyone’s list. To compare Geico vs Progressive customer service, we looked at J.D. Power’s 2017 U.S. Auto Insurance Study. All the data collected was from 44,681 car insurance customers across the United States. Geico dropped from 1st place in 2016 to 8th place in 2017 with a score of 805 for overall customer satisfaction. Progressive has increased in 4 points since 2016 but still holds on to its 10th place spot. In Texas, we see that GEICO increases to 3rd with a score of 830ds and Progressive in 9th with a rating of 795. 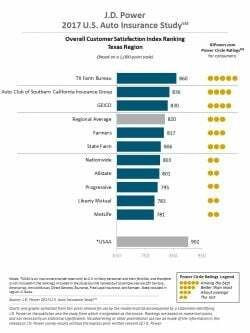 One thing to note here is that the smaller insurers are beginning to surface with Texas Farm Bureau at the #1 position with a rating of 860. 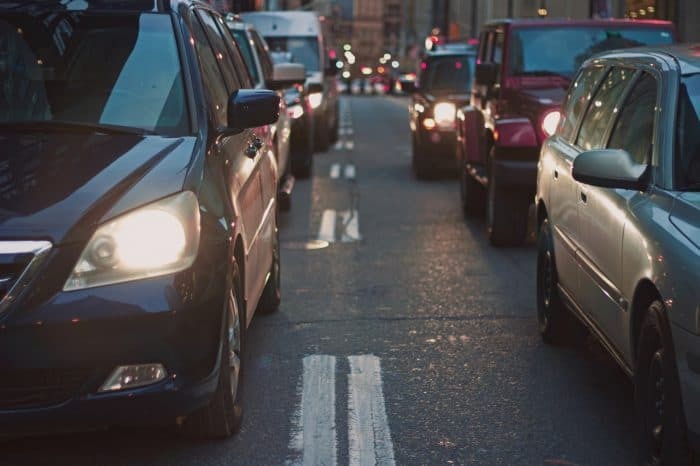 Smaller car insurers are overtaking larger car insurance companies due to the positive perceptions of price to where the smaller insurance agencies have an advantage with lower, competitive rates. 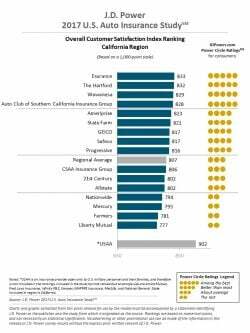 We see a large jump in customer satisfaction ratings for smaller insurers in California. The chart below projects Esurance, The Hartford, Wawanesa, and Auto Club of Southern California Insurance Group in the top 4 positions. With smaller insurers on an upward trend of customer service excellence, it would benefit you most to spend 5 minutes comparing their rates against the big guys at Geico and Progressive. See how much you can save on your auto insurance policy below. Now you have a better idea of what distinguishes Progressive and GEICO, but how do you choose? When you’re weighing the benefits of auto insurance, it helps to carefully read the company’s own descriptions of their offerings as well as recent customer reviews.